In April we visited Japan, our second time in the country. We loved it so much the first time we had to return the very next year. We travelled from London to Tokyo Haneda by AirChina, which I wouldn’t recommend. The online check in process was complicated and the customer service on a whole wasn’t great but at the end of the day the tickets were cheap. Once at the airport we picked up a PASMO card, which we preloaded with about £50s worth of yen and then set off back to our apartment. I would recommend these cards to anyone, they are a much simpler process than buying train tickets all the time. We stayed at an apartment we found on AirBnb which was quite compact but had a perfect location and was incredibly priced. I find that renting an apartment is really the only option in Tokyo if you’re on a budget or if location is really important to you. So on our first full day we awoke and had a lazy morning sorting ourselves out before heading out around 10am. We walked to Shinjuku station, only a 10 minute walk from our apartment, in order to pick up our rail passes. It took an hour, longer than I had thought, but the queue was quite long. Then we headed to Shinjuku post office, in order to pick up our portable wifi. The post office was well signposted and quite easy to find. I ordered my device from CD Japan, the same company I used last year and still the most competitively priced. Finding the post office may have been no problem but once within we got a bit confused at the layout and which counter was for which purpose. Unfortunately however well prepared you are you’ll always meet these kinds of situations. Having done our ‘admin’ it was now noon and we were absolutely starving! The good thing about Japan is you’re never too far from a convenience store so we sought out our nearest one and headed in for snacks. 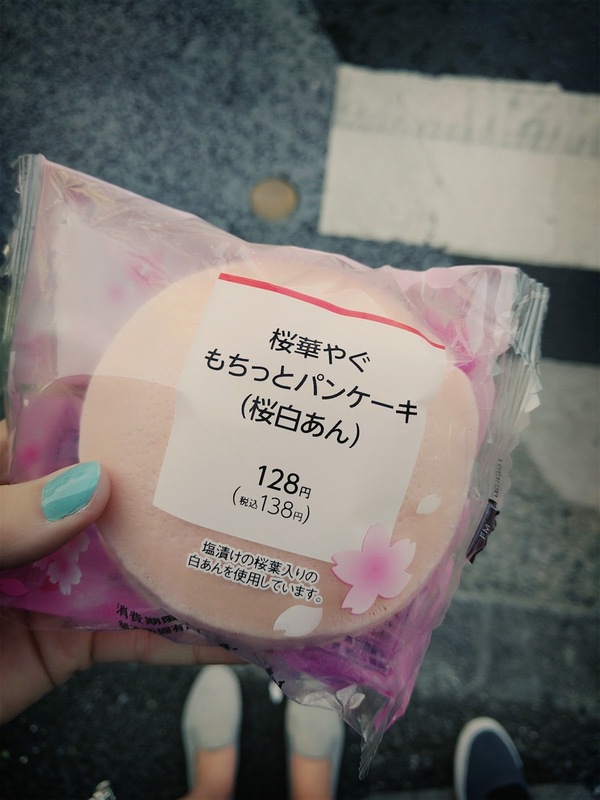 I got some pink sakura themed pancakes, which were delicious! Cherry blossom season is always a great time to visit Japan because there are so many novelty food items to try! We had decided to give ourselves a pretty chilled out day on our first full day, suspecting we’d feel quite tired. 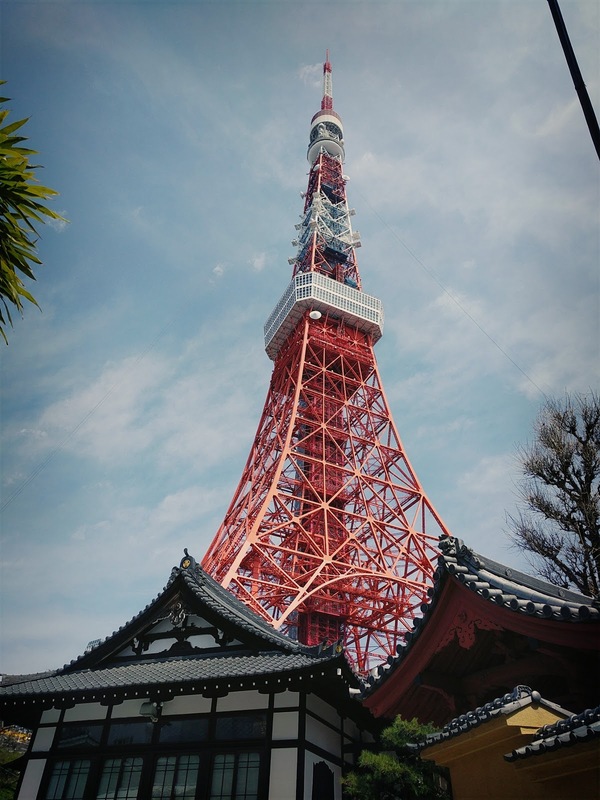 Ultimately I didn’t want to be jumping around too much on the metro, our first half of the day was spent at Tokyo Tower. The tower is the second tallest structure in Japan and certainly dominates the local landscape. Our purpose for coming here was not to ascend the observation tower but instead go to the ‘One Piece’ part of the tower. One Piece is a popular manga series about pirates and holds the Guinness World Record for most comics ever published by one author. It is the bestselling manga series in all history and you can’t go long without coming across it in Japan. 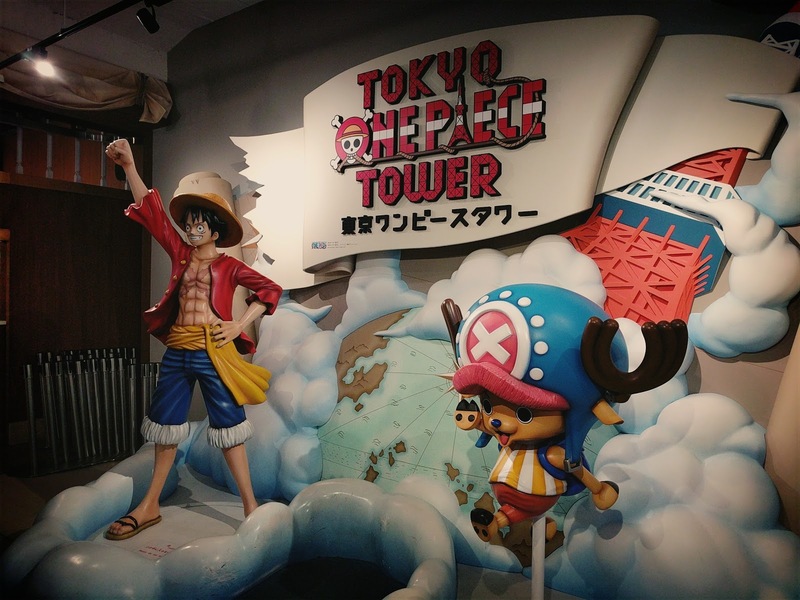 I was pretty oblivious to it before heading here last year but have since read, watched and played various One Piece things and Adam and I have become quite the fans. 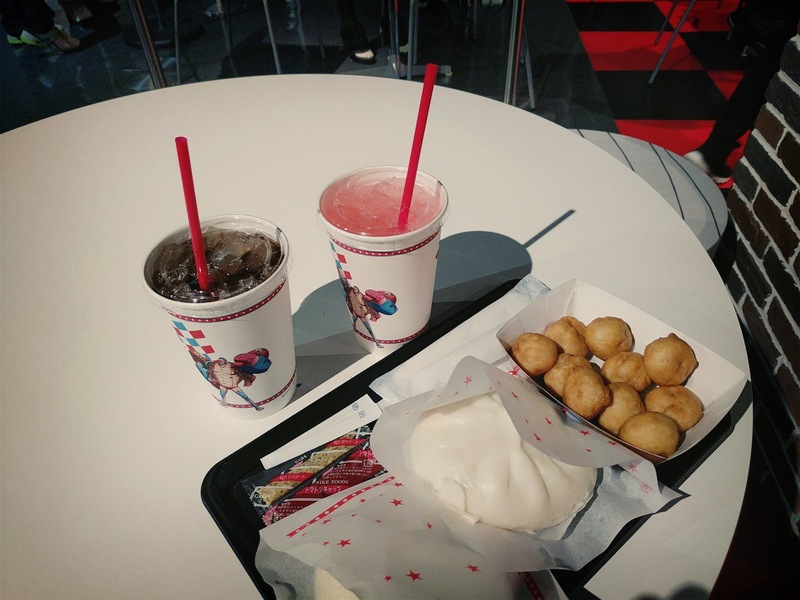 We stopped at Franky’s cola bar where we got steamed buns, mini corn dogs and I had a lovely pink lemonade. They had a gift shop both inside and outside the attraction, and the outside one actually had the better items. The best thing about the experience was the live show. Although it was all in Japanese it was very impressive with some fantastic effects. The tickets cost 3000 yen, which was a slightly reduced price because we had bought it in advance online. The park is very much structured towards children and Japanese speaking ones at that. We enjoyed it but that was really only because we’re fans of the series. We still got around it pretty quickly, spending around 2 hours there in total and that included time in the gift shop! We spent a while walking around the tower and visiting some of the shops before we wandered outside. It was National Autism day so there were some festivities going on outside the tower. We had a walk around and found ourselves in a pretty little park. One of the things I love so much about Tokyo is its a city of contrasts, old and modern, skyscrapers and parks. There is so much green space to enjoy! We then got the monorail to Aomi. The monorail is a really lovely way to see the area, looking out over the water and we even crossed the famous ‘Rainbow bridge’. We were even able to witness a car drag race whilst stopped at a station. 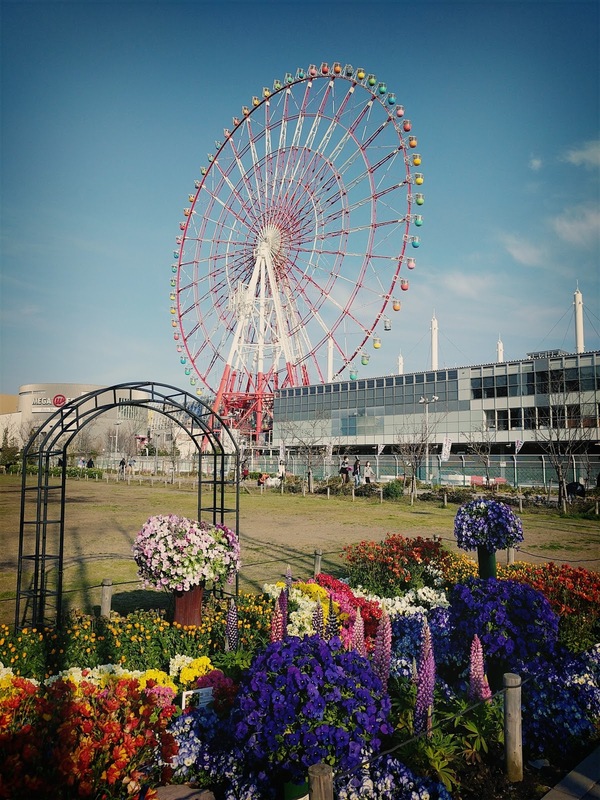 Odaiba, the bayside area, is really beautiful and certainly worth a visit if you have the time in your itinerary. Walking around the area offered lots to see. 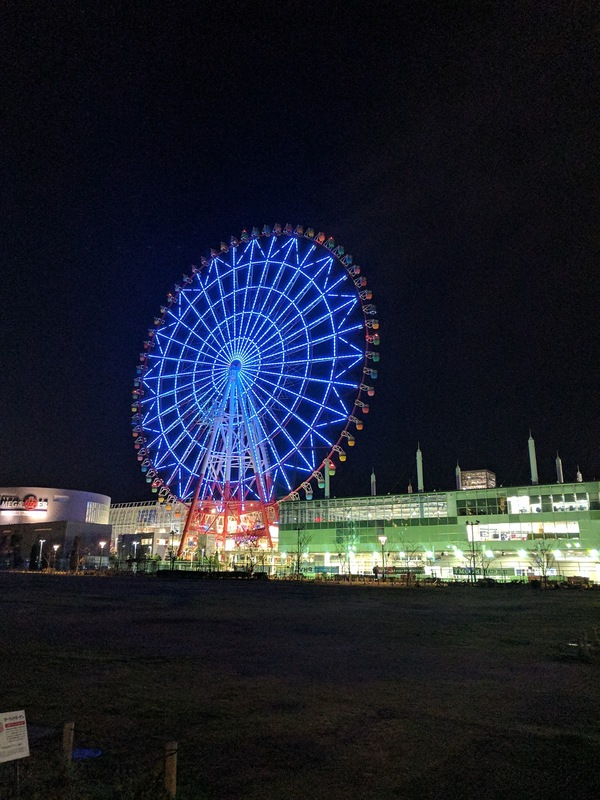 We came across Pallete Town, a place that offered shops and great views of a huge ferris wheel. 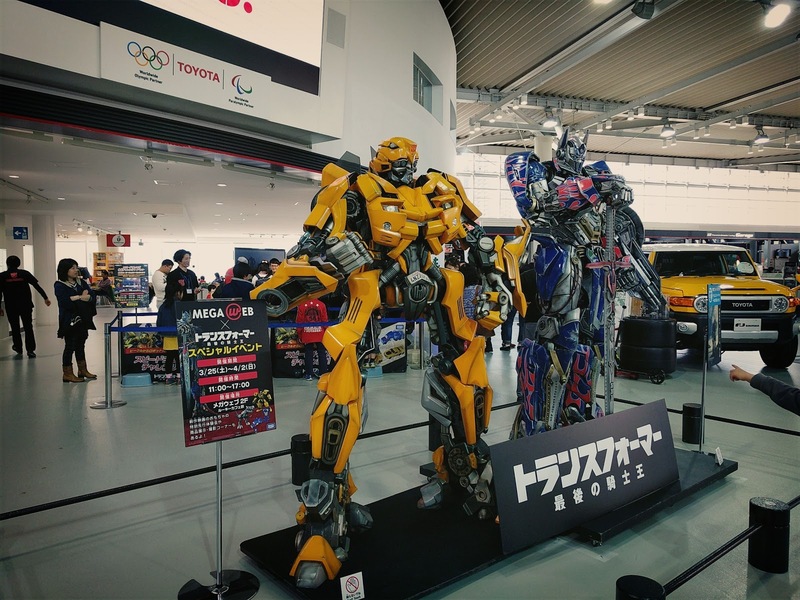 We also found Megaweb, which showcases Toyota cars. We were drawn in by the large Transformer models (Adam is a huge fan) and had a look around, there were lots of children in there taking part in lots of car related activities and they were so damn cute! Adam got pretty jealous he was about 25 years too old to join in. 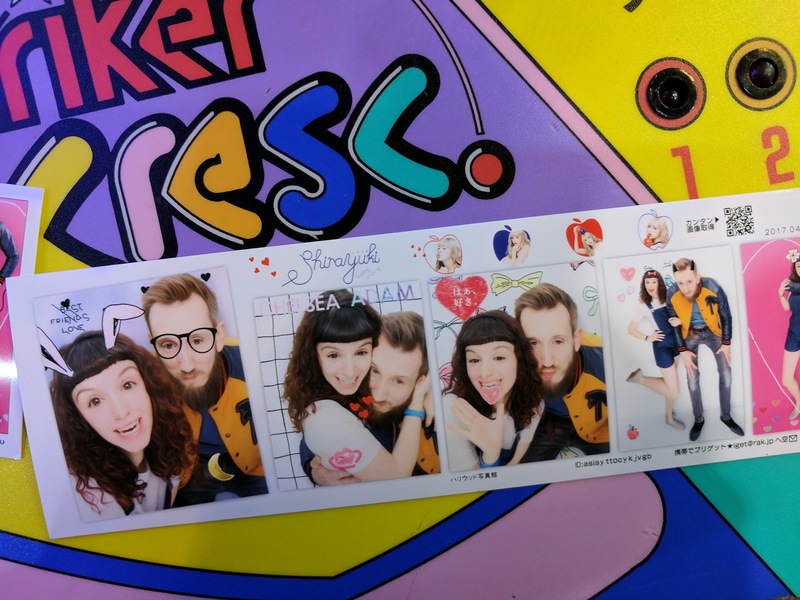 We entered the Decks Mall where we walked around the shop and managed to find one of my favourite things, the Japanese photobooth, known as Purikura. They cost 400 yen and they make such a great souvenir. 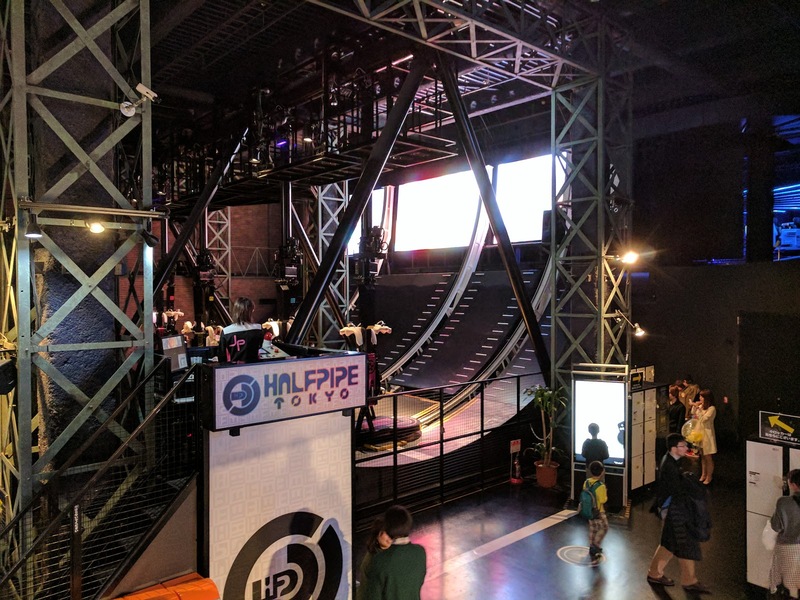 Our purpose for visiting Decks Mall was to go to Joypolis, the sega amusement park. We had visited it last year and we really had so much fun! It costs 3000 yen to enter, after 5pm, which included a discount of 300 yen we got for having our passports. When inside our first stop was for a cheese and ham crepe, as we’d worked up an appetite. There were lots of rides and whilst they are all in Japanese there was no understanding needed, they all had very simple concepts. 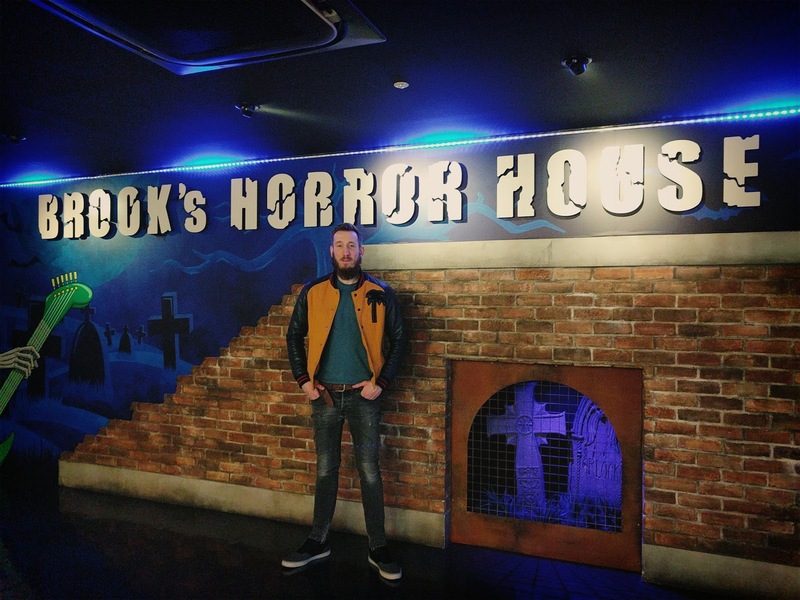 ‘The house of the living dolls’ was an amazing VR experience and that was very scary, I even closed my eyes at one point so I couldn’t see what was going on haha. We found they always overestimated the waiting time for the rides and actually it only worked out being about a quarter of what it actually said. The longest time we ever queued was 15 minutes. For first day back in Japan was so chilled and fun and a reminder of exactly why we’d returned! We were so happy we had another 2 weeks ahead of us! Interesting read. Cool photos throughout your blog too! Thanks for sharing.